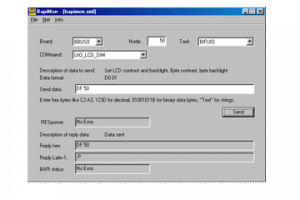 Includes Line test (continuous data exchange) standard or "Quick brown fox"
The main dialog window of this Windows application allows the convenient exchange of test commands with a slave. Known tasks on the node are presented for selection from a drop down box and subsequently individual commands can be selected. BAPImon displays a command description and syntax and accepts input of hex, bit or string data. 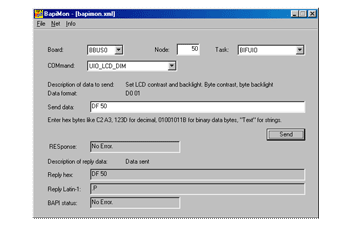 A "Send" button initiates the transfer and presents the answer as both hex and text (Latin-1 character set) data. BAPImon comes preconfigured for the standard BITBUS RAC/GBS-task. It offers all standard commands and all mCAT-specific extensions. The command list and syntax description are part of an XML file that can be user modified with a standard text editor. Commands can be added or deleted and whole tasks can be described in command detail (see below). From the file menu, different configuration files can be selected. Usually a session will start by finding the nodes attached to the BITBUS network. This utility is called "search net" and can be started from the "Net" menu. Search net asks you to select a specific board if there are various in the system and starts to scan the network after klicking the "Search" button. All nodes found are displayed in a list with their "System Info" text. With that information one would go back to the main dialog and select the node address of the station to work with. The following box displays a list of known tasks running on that node, i.e. at least the GBS-task - others if their function codes have a (user supplied) counterpart in the XML configuration file. From that task a specific command may be selected in the following list box. A description is presented and an example of the data to enter. After filling the input line with appropriate data the SEND-button will initiate a message cycle. The resulting answer gets displayed as Hex and ASCII in the lines beneath. This utility can also be used if the user task has not been described in the BAPIMON.xml, just enter the task number (hex) and likewise the command. Another universally useful tool is the line test - it continually exchanges messages with a specific slave node. While looping, the program displays the number of cycles, the number of errors and the last error code received. While usually a GBS_GET_NOTE-INFO message is exchanged, there’s an option for newer mCAT2 slaves to send a "quick brown fox" message that gets tested both ways. Line test is an ideal tool to have continuos transfer in EMC-test situations. BAPImon works with all BAPI compatible master boards.